I'm trying hard to pull apart the Professional to strip the frame and get it painted (eventually...), but the dust caps on the crank arms seem to be frozen in there (being steel in an aluminum crank). Honestly, I think I'm just going to take this damn thing out and back it over with a car a couple times. That'll loosen things up! Anyway, if I just took a bucket of ammonia and stuck the bottom bracket in, do you think enough would get in there to take care of the problem? Also, does household ammonia work on frozen parts, or do I need to spring for the stronger stuff? This bike can honestly go as long as it takes - I'm not in any hurry. PB Blaster and 24 Hrs. Great stuff for stuck parts/fastners. Bikes: I just ride them, they own me. +10 on the PB Blaster. Let is soak. After the soak, take a wooden dowel or block of wood and place it against the cap, then give it (the wood) a firm, hard rap with a hammer. This will also help things along. trans female, out and proud! +100 on the PB blaster, or any rust penetrant. give it a few days to work in. That will help with aluminum oxide? Alright, I'll start it soaking. I despise those damned things. The last two times I've gone to work on a BB I've had trouble with those damned things. The first set were soft metal that immediately rounded out. I drove an old screwdriver into them & unscrewed them. Lastnight's pair were plastic. I ended up breaking them up & removing them in pieces. I'll find out tonight if the threads are OK. I'm debating leaving them out from now on. If they're steel they'll come out once you crack the oxidation holding the two pieces together. PB blaster or ammonia will help. If the dustcaps are plastic or aluminum you will probably have to take the caps out in pieces once you break them apart. I had a pair of Nervar caps that did this and ended up having to grind out the caps before being able to pull the arms. Yeah, I'm not a fan of the metal ones (though they ARE pretty). I'm just cringing at destroying them though because, although they're already rounding out, they're Campy, and it seems hard to get these bad boys. Drill two small holes in the steel dustcap and use an adjustable pin spanner to loosen (after giving the area a shot with PB Blaster and letting is seep in and help loosen). I despise those damned things... I'm debating leaving them out from now on. I wouldn't advise that. Replacing damaged caps is far less expensive than replacing damaged crankarms. I've seen too many owners come into the shop with damaged crank extractor threads because they tried to insert the tool into dirt encrusted threads. Just grease the caps' threads or replace the threaded caps with some inexpensive, plastic, press fit models. Once they're rounded out they're useless without modification. Best off luck with your choice of removal options. Where do you get the press fit caps? They sound like a good idea. My Univega's cranks came with them...They're convenient, but fugly. 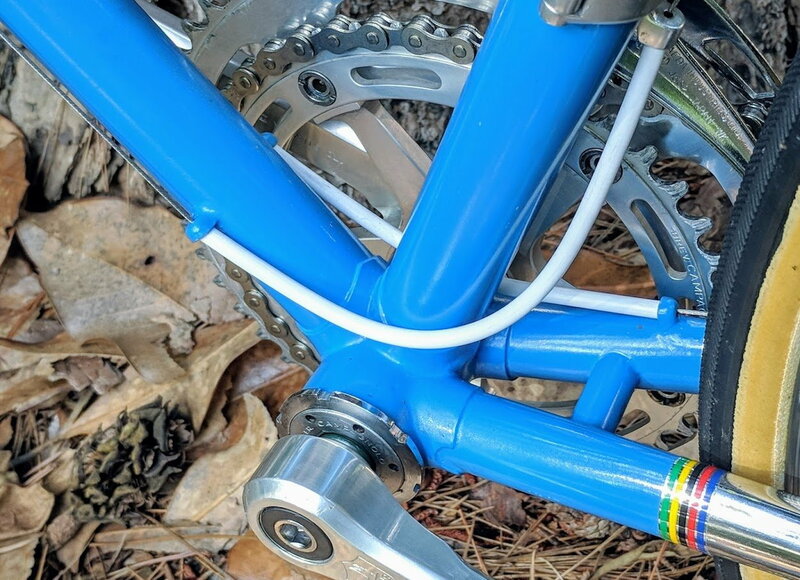 It saved my Vitus restoration project this fall after WD40, Liquid Wrench and PB Blaster all failed to release my super seized-on stem from my fork. Also released the lockring on my bottom bracket and fixed cup within minutes after the other said chemicals also did not work. Mke sure you concentrate the Freeze-Off blast from the can on the item you would want to shrink away from the other material (The steel dustcaps in your case). PB Blaster, which seems to have a big following here, turned out to be very dissapointing in my case, despite the extended soaking and podigious use of a dead blow mallet. You should be able to get them though any LBS. They come on most of the entry level cranksets. My supplier lists replacement press fit caps for $0.80 per pair. Sure, they're not very pretty but at that price you don't worry about messing them up and they're cheap insurance compared to going capless. Yeah, but they were on dope when they did it. Seriously, the reason the pros ran cranks without dust caps was to facilitate the servicing. When you have to tighten a loose crankarm on the road or overhaul a dozen bottom brackets overnight, this can make quite a bit of difference. Besides, their cranks were free and there was always a spare readily available. There's no reason for non-pros to risk going capless. It's a big problem with the Stronglight cranks like the 93 that use a steel cap. 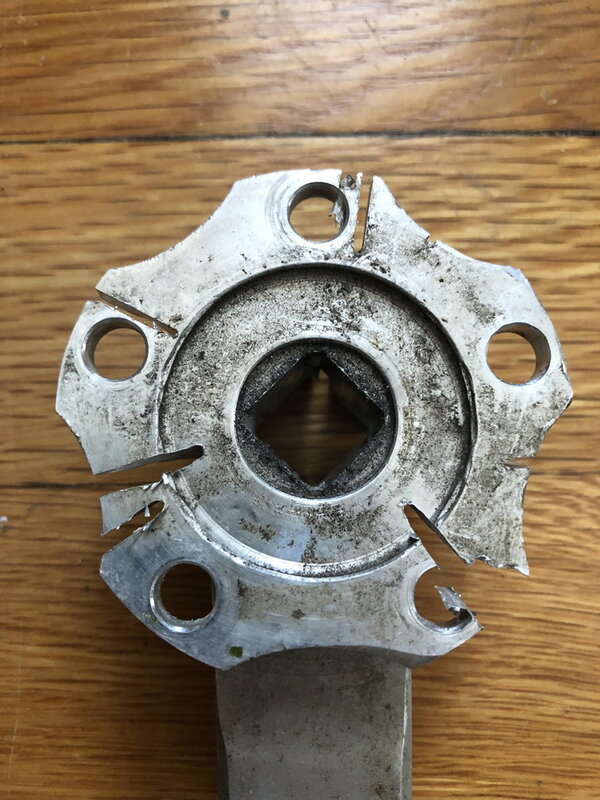 The keyway is very delicate and mechanics neglect to grease the threads. Replacement caps are hard to find and have become very expensive. The older aluminum caps are actually a better replacement because you don't have unlike metals together, but they just don't look right. You won't have any trouble finding replacement caps on eBay if you're talking about an old Record crank. I haven't had a problem with them getting stuck since I started using anti seize compound on them. I had good luck heating the crankarm with a propane torch. You dont have to balst it very long, just a few seconds to expend the aluminum. You should be able to get them though any LBS. I'll be running my Mavic 630 SSC cranks on my Vitus Carbone without them too......but maybe mostly because the NOS set I just got don't have them! Better to leave them out to so they don't get seaized onto the cranks in the future.......putting the dustcaps on promotes the buildup of deritus and moisture in the bolt well through their slots and holes........just like a bellybutton that collects lint! Will the amonia get in there after you've (I've) used PB Blaster? Seeing a few recommendations here for heat (though too late) I bought a heat gun and after carefully heating the crank arm, on a different bike with stuck Nervar crankset dust caps, around the cap, trying not to heat the cap itself, I was able to remove the cap without destroying it, or the the hex slot. I'll be using heat where possible from now on! I'll also be using anti-seize on these caps in the future. In a different thread someone also suggested freezing the cap and heating the arm. All that just because of the cap? How long a cheater pipe did you slide onto the allen wrench when you tried it? Did you perchance try a large-ish vise-grip around the outside of the cap, with a cheater pipe? I would have thought an easy-out into the allen hole might also have worked. Or perhaps slicing the cap in two with a very small cutting wheel on a Dremel. There is a guy from Australia on ebay who sells new aluminum alloy dust caps threaded for Stronglight, Specialites TA, and standard threaded cranks. Got some myself and was very pleased with them. He goes by the name of "bespokechainrings." A wierd thing--I just looked at his listings, and when they first pop up they list the shipping cost as 24 dollars (more than the item!) but then when you click into the listing, it says international shipping is 6 dollars. Don't remember what I paid but it certainly wasn't 24. I would have thought an easy-out into the hex key hole might also have worked. Or perhaps slicing the cap in two with a very small cutting wheel on a Dremel. 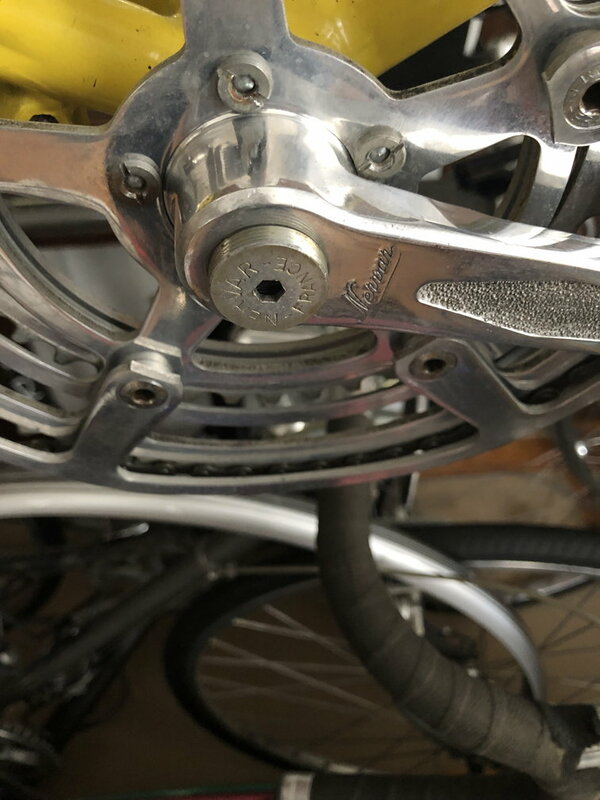 Background: The bottom bracket (or crank) was loose therefore the need to remove. I didn't use a cheater pipe on the hex wrench - never thought about it ... I'm not sure it would have helped with deforming the slot, but maybe, given the extra leverage it would have, by perhaps freeing the cap where a hand turned wrench only deformed the slot? After rounding the hey key hole with a hex wrench, I tried Dremeling a slot in the cap and with heavy pliers turning with a quarter, nickel, dime, and penny, to try to turn the cap, each of them bent and didn't budge the cap. 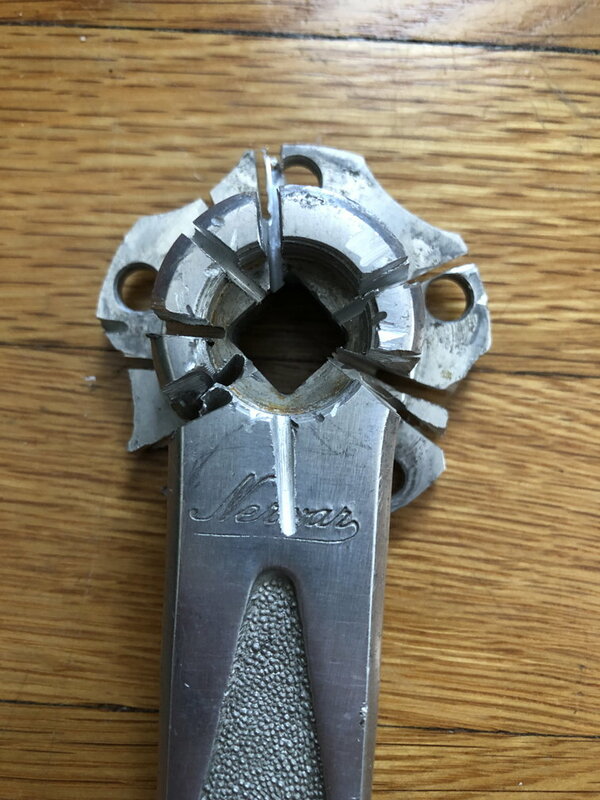 Then, in cutting the cap out with a Dremel, I believe I damaged the crank arm marginally, the threads or arm face near them (maybe cutting wheel was too big? ), and decided maybe a little hastily to be done with it (I had a different crankset lying in wait). The cap on the Nervar crank kind of flaked out very stubbornly, like a window pane, somewhat different from the TA Cyclotouriste caps which I had in the past freed with a Dremeled slot and a quarter without damaging the arm(s). Holes for a pin spanner also seem to have potential. But I'm liking a heat gun for any future dust caps. Thanks for the info, I think I might have seen that seller, and it looks like they have a website. Those caps look good on your bike, from what I see, your bike looks great (I like the color stripes on the chain stays and blue paint).